Development of program of graphics drawing functions of one variable. 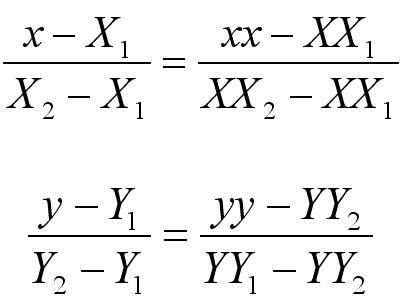 The function is defined by the formula. The function is defined by the formula. 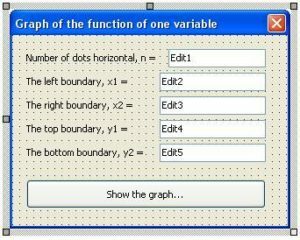 Develop the application, in which a graph of the function is built. The graph of function must be displayed in a separate form. 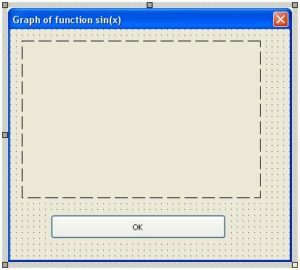 To build any graph of the function y = f(x) must specify a rectangular area of the screen, in which the graph of the function will be displayed. – (x2; y2) – right-bottom corner of the screen. In the construction of on-screen graphs of functions, it is necessary to implement the scaling rectangle with coordinates (x1; y1), (x2; y2) into the rectangle with the screen coordinates (xx1; yy1), (xx2; yy2) as shown in Figure 2. When calculating the vertical screen coordinates, you must use the sign to take into account that the line numbering goes from top to bottom. 1. 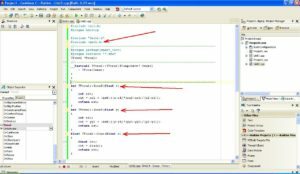 Run Borland C++ Builder. 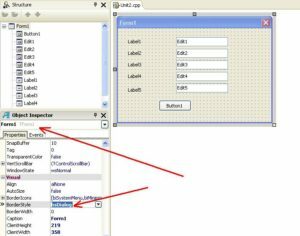 Create the project as “VCL Form Application”. Automatically, main form of application is created. Name of form “Form1”. 2. Creating the basic form. – one component of TButton type. The object with name “Button1” is created. Correct the positions of components on the form as shown in Figure 3. 3. Setting of the form. – from the tab Miscellaneous set the property Position = “poScreenCenter” (Figure 5). This shows the form in the center of the screen when application is run. 4. Setting of properties and size of components, which are placed on the form. – in the component Button1 the property Caption = “Show the graph…”. Also, you need to change the size and position on the form of the component Button1. Approximate views of the form with the placement of components is shown in Figure 6. 5. Programming of event of Form1 activation. When the application is running, you need to program the event OnActivate of main form of application. An example of event programming in C++ Builder is described here. In the event handler the fields of type TEdit are filled. These fields are the coordinates of the rectangle area of the screen in which graph is shown. The rectangle area is set by coordinates of left-top corner (x1; y1) and right-bottom corner (x2; y2). 6. Creating a new form and show of the function graph. 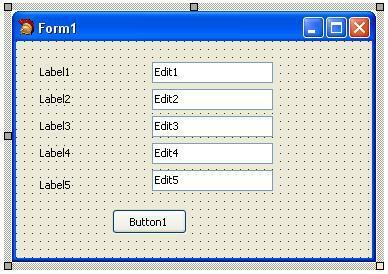 Create the form named “Form2” by the example as shown in Figure 7. 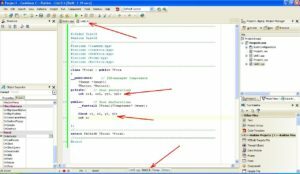 An example of creating of a new form in C++ Builder is shown here. 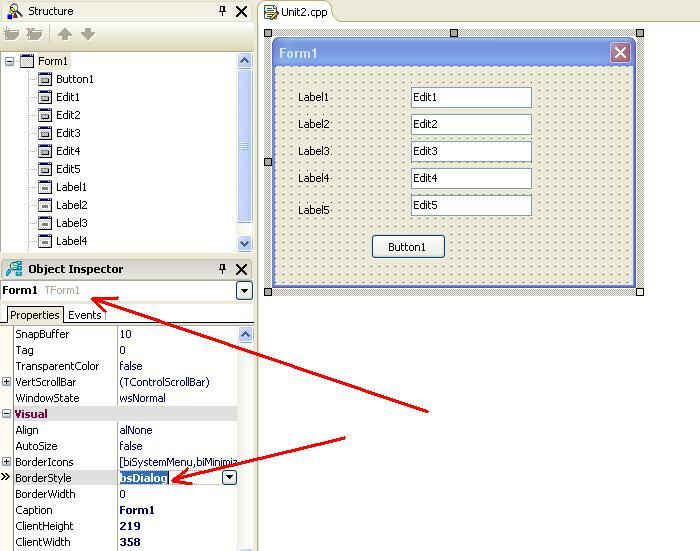 The form «Form2” is defined in the files “Unit2.h” and “Unit2.cpp”. – component of type TImage. 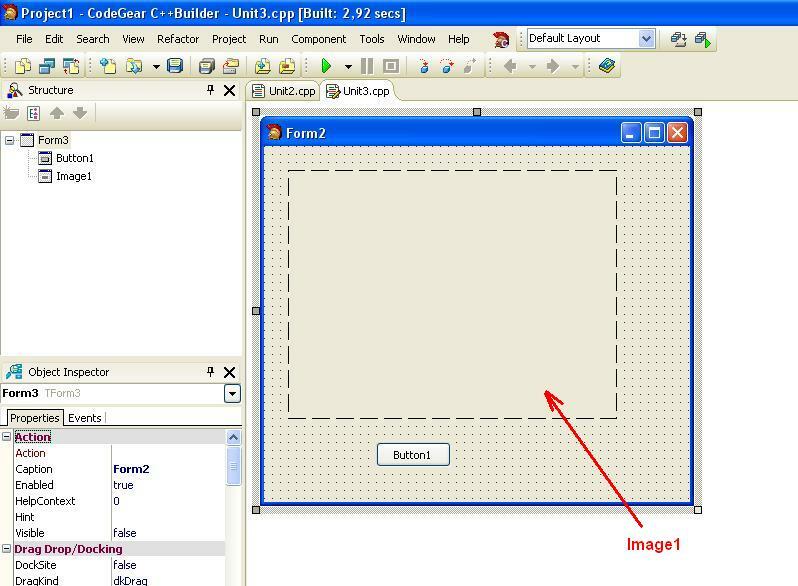 The object “Image1” is created automatically. In this component the graph of function sin(x) will be showed. – in component Button1 property ModalResult = “mrOk”. This means, when user clicks on the button “Button1” – main form will be closed with the returning code “mrOk”. – from the tab Miscellaneous property Position = “poScreenCenter”. As a result, the form will be showed in the center of the screen. Also, you need to correct the sizes and positions of components Button1 and Image1. As a result, the form “Form2” will have the following view (Figure 8). 7. Programming of additional functions of scaling and calculating sin(x). 7.1. Inputting the internal variables in the Form2. It is needed to enter the following internal variables in the text of file “Unit2.h” (Figure 9). For this, you need to do the following actions. 1. Go to the header file “Unit2.h” (Figure 9). These variables correspond to the screen coordinates (see Figure 2 b). 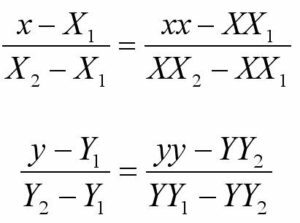 These variables correspond to the actual coordinates (Figure 2 a) of the rectangular area, which displays a graph. The variable n sets the number of points, which are connected between them. The greater the value of n, the more smoothly the graph appears on the screen. The value of these variables is filled from the main form “Form1”. Therefore they are placed in the section “public”. 7.2. Adding the conversion functions and computation functions of TForm2 class. In the module of form Form2 you need to create two functions of conversion of actual coordinates in the screen coordinates. The functions are named ZoomX() and ZoomY(). Also, you need to add function of calculation sin(x). The name of function is func(). First of all, in the file “Unit2.h”, are added prototypes of functions. The prototypes are added in the section “public”. Next step, you need to go to the file “Unit2.cpp” (Figure 10). 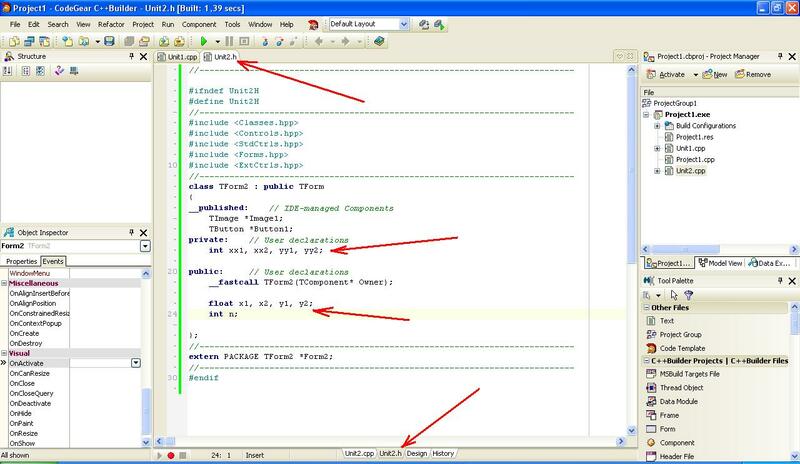 In this file the implementation of class TForm2 is described. In the code snippet above, the functions ZoomX() and ZoomY() are getting as the input parameters the corresponding values x and y, which are the actually coordinates. Then, the conversion by formulas from mathematical formulation of the problem is realized. Function func() gets as input parameter the value of local variable x. In the body of function is calculated the value of sin(x). In this place you can insert any other own function. Figure 10. File “Unit2.cpp” with the entered functions ZoomX(), ZoomY() and func(). This string connects the standard library of mathematical functions. The function sin(x) is realized in this library. 8. The event programming of Form2 activation. The graph of function is displayed in the form Form2, when you clicked on the button “Show the graph…” of form Form1. 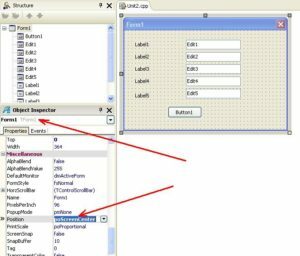 Therefore it is advisable to program the output of graph in the event OnActivate of form Form2. 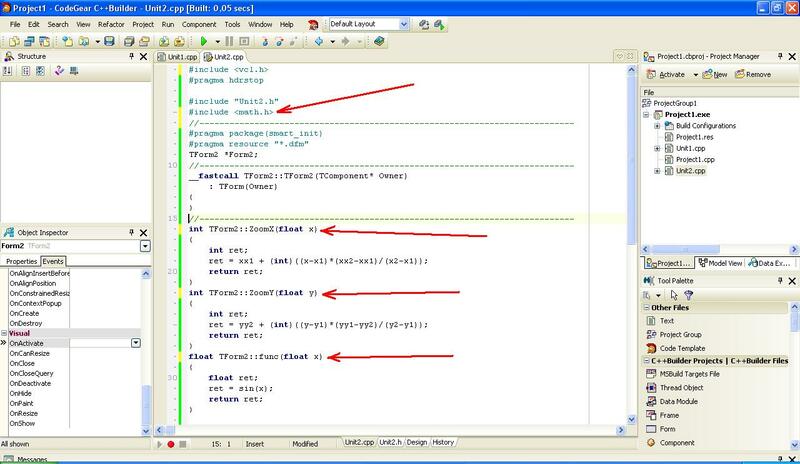 The event handler is realized in the file “Unit2.cpp”. // 2.2. Take the point of origin X of the screen. // 2.3. Take the point of origin X of the screen. // Draw the Y axis. // 3. Drawing of the graph. 9. 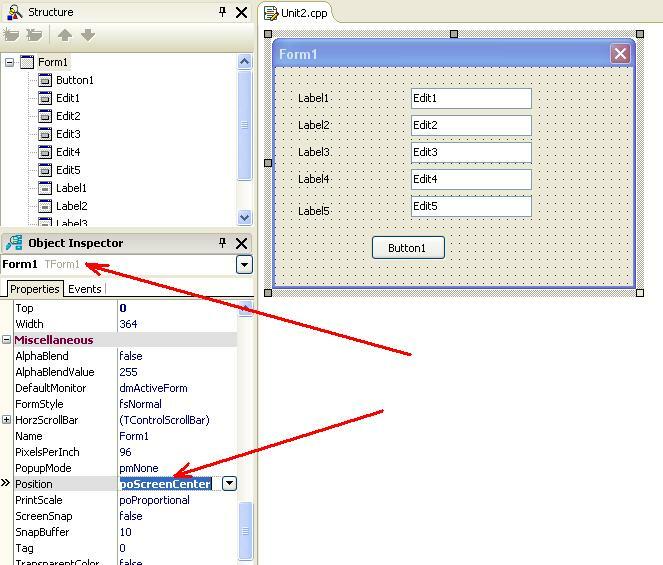 Programming of event of click on the button “Show the graph…” of form Form1. The last stage is the programming of event of click on the button of show the graph. For this you need to do the following actions. 9.1. Connecting of Form2 to the Form1. 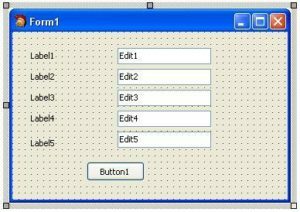 An example of creating the new form of application is described here in details. Thereafter, the methods of “TForm2” class are available from the Form1. 9.2. 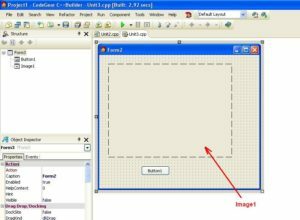 Programming of event of click on the button “Show the graph…”. In the code is formed the variables n, x1, x2, y1, y2. After, you can run the application (Figure 11). Figure 11. 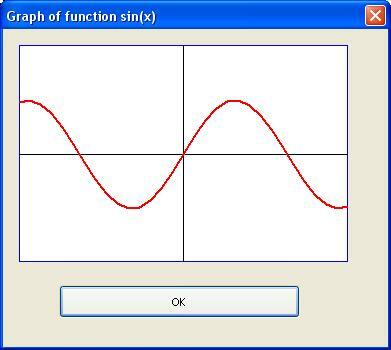 The graph of sin(x).